„Monetarist experts warn that the global money supply is slowing much faster than widely appreciated, suggesting that the shift away from quantitative easing by the major central banks is already starting to have profound consequences. The data appear incompatible with forecasts by the International Monetary Fund and other global bodies for a synchronized global upswing this year.“ – bto: Es wäre nicht das erste Mal, dass sich IWF und Co irren. 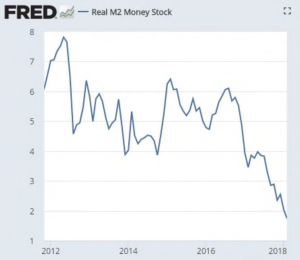 „The growth rate of the ‘broad’ M3 money supply in the US – covering a wide range of deposit accounts as well as cash – has dropped to a six-year low and is flirting with ‘stall speed’. (…) Professor Tim Congdon from the Institute of International Monetary Research said the US Federal Reserve has misjudged the full impact of reversing QE and may be making a serious policy error by withdrawing stimulus too quickly. ‚I don’t think there will be a recession because the Fed will change course, but there may well be a ‘growth recession’, and it is a big threat to asset prices,‘ he said.“ – bto: Und wenn die Assetpreise fallen, dann gibt es eine neue Krise und dann eine Rezession. So einfach. „Critics say the Fed is relying on a broken model and pays no attention to broad money data, preferring backward-looking indicators such as unemployment and wage growth. This ‘New Keynesian’ outlook led to a series of mistakes in 2008 when it ignored red alert warnings from the monetary aggregates and allowed the incipient financial crisis to metastasize. “ – bto: wobei es ein Problem der viel zu hohen Verschuldung ist. „The eurozone is at a different stage of the cycle but the money data is nevertheless disturbing. 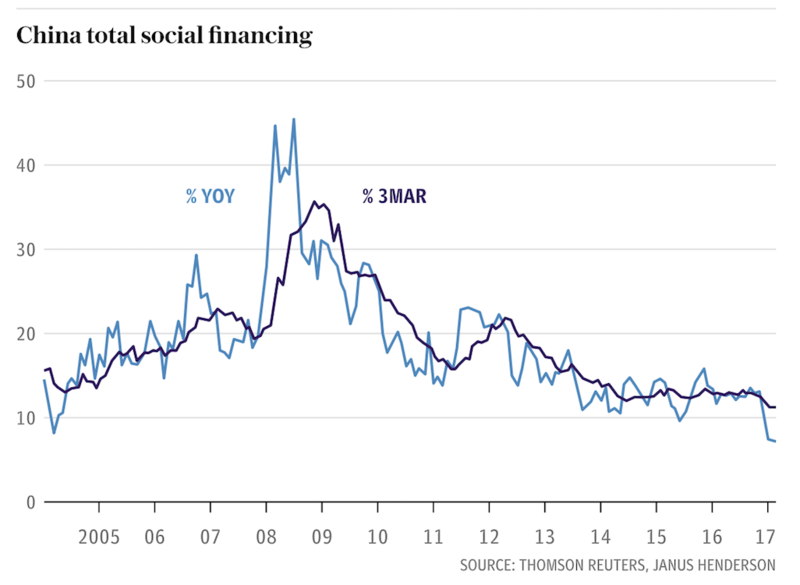 Simon Ward from Janus Henderson says the growth rate of non-financial M3 has dropped to 2.3pc over the last three months, the slowest since the eurozone debt crisis.“ – bto: Na das wird ein Spaß werden! „‚The ECB is (…) going to be in a lot of trouble by next year,‘ said Prof Congdon. The central bank is running out of options. It has already pushed its balance sheet to 42pc of GDP under Mario Draghi and is nearing the technical and political limits of QE. 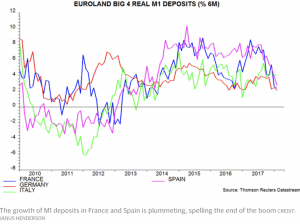 (…) ‘narrow’ M1 money in the eurozone has been plummeting since last September, with a sharp fall in real M1 deposits in France and Spain that has attracted little notice so far.“ – bto: Man kann eben eine Überschuldung nicht so einfach aus der Welt schaffen. „With the usual delay, the slowdown is starting to become visible in the hard data. Eurozone industrial output fell 1.1pc in February. The IHS Markit survey of manufacturing has slowed for two months in a row, with a marked slide in new orders. Citigroup’s ‘economic surprise index’ for the region slumped to minus 31.5 in March, a sign that market analysts have been caught off guard.“ – bto: Und wenn wir dann noch Neuwahlen in Italien bekommen, viel Spaß! „‚ECB tapering QE looks too early to me. They don’t seem to have noticed that the growth in the stock of bank loans has only been growing at about 1pc per annum for the past three years. This suggests that eurozone bank crisis resolution may not be complete. If your banks aren’t fixed, you’d better not remove QE or things may come to a fairly abrupt stop,‘ said Mr Ferguson.“ – bto: So ist es nun mal, wenn man pleite ist. Man kann nicht mehr Schulden machen oder will es nicht. „Nor is there any comfort from China. The explosive credit and fiscal stimulus launched by the Chinese authorities in 2015 and 2016 is largely exhausted, after having pushed the debt ratio to 257pc of GDP. The central bank (PBOC) has been tapping the brakes since the middle of last year. (…) the growth rate of China’s ‘real true M1’ (six-month annualized) has dropped to 1.6pc, down from double-digit levels in 2016. Underlying economic growth has dropped to 5pc – using proxy measures – and this is showing up in rising inventories of iron ore and raw materials.“ – bto: Die Chinesen sind wie wir in der Schuldenfalle gefangen. „The global monetary slowdown is hard to separate from the effects of rising US interest rates. The Fed’s main rate has risen six times to 1.75pc, constricting a global financial system that has never been so leveraged to US borrowing costs. The Bank for International Settlements estimates that offshore dollar debt in loans or equivalent derivatives has ballooned to $25 trillion.“ – bto: Es wäre wieder mal ein Margin Call fällig. Und da scheinen wir ihn zu bekommen: „Three-month dollar LIBOR rates have risen 62 basis points to a nine-year high of 2.31pc since the start of the year. A report last week by the New York Fed said that $200 trillion of derivatives are priced off LIBOR – ten times US GDP – as well as $2.3 trillion of syndicated loans, $2.3 trillion in mortgages, $1.1 trillion in floating rate notes, and so forth. The rates reset rapidly. The spike amounts to a global credit shock. The LIBOR squeeze is gaining worldwide attention. The parallel monetary squeeze has so far gone largely unnoticed. It may be just as significant.“ – bto: Ich denke, Skepsis ist angebracht. Beobachtung der Entwicklung der Geldmenge ist auf jeden Fall EIN sinnvoller fundamentaler Indikator für die Abwägung von Chancen und Risiken an den Börsen. Spätestens unter 6% jährlichem Wachstum der saisonbereinigten Geldmenge M1 im Euro Raum (andere Betrachtung als im Chart im obigen Text) sollten zumindest die Warnleuchten an sein. Garantien bietet aber auch dieser Indikator nicht.